ESPN’s 30 for 30 has helped produce some of the best sports documentaries of the 21st century since the series premiered on the network all the way back in 2009. Fascinating documentaries ranging from the 2003 Chicago Bartman incident, former Longhorns running back Ricky Williams and his struggle with drugs, the death penalty against the SMU football team in the 1980s, and so on. So many great documentaries have come out of this Emmy-winning series, but O.J. : Made in America might very well be the best film the series has ever aired. Airing in its original 7 and-a-half hour format when it premiered at the Sundance Film Festival, ESPN picked up the rights to air the documentary and have spread out the film into five 90 minute parts throughout a week. The first part aired on ABC last Saturday, and the next four have been airing throughout the week. However, if you are a cable subscriber to ESPN, you can access the documentary in its entirely right now through the WatchESPN app. If you’re not watching this documentary yet, I highly suggest you do so. 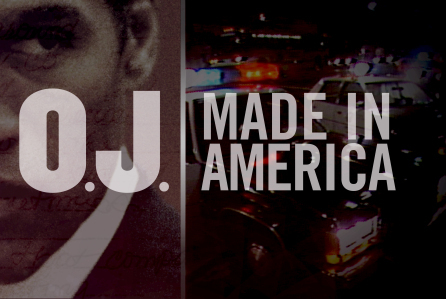 Made in America tells the story of O.J. Simpson, arguably the greatest college football player of all time and one of the greatest NFL football players of all time. The film chronicles everything in Simpson’s life, from his days at USC winning the Heisman trophy in 1968, to his days playing for the Buffalo Bills and breaking racial boundaries by not only becoming the first major athlete to endorse a product, but the first African-American athlete that everyone accepted. We also chronicle O.J. and his marriage to Nicole Brown Simpson, and the deadly demise to that said marriage that captivated the whole country and escalated racial tensions during the “Trial of the Century”, to where O.J. is now, in prison for armed robbery charges. My description of Made in America, directed by Ezra Edelman, is a film that also chronicles the history of African-America oppression in Los Angeles during O.J.’s most prominent years. While O.J. is breaking records and being loved by USC – a predominantly white school – the Watts Riots had just occured, and the year O.J. won his Heisman in ’68 was one of this country’s most vulnerable years with the assassinations of both Dr. King and Bobby Kennedy, not to mention the Vietnam War getting worse and racial tensions across the entire country. As this was happening, O.J. was in his own little world. They mention countless times in the documentary how O.J. never saw himself as black, and in his own world he transcended race due to his incredible athletic talents on the football field and on the track. A lot of it probably had to do with the fact that he went to a school like USC that was (and still is) a school were rich white students go. The film goes on to explain that the reason O.J. was as popular as he was had to do with the fact that white America saw O.J. Simpson as safe. He didn’t speak up for African American’s during some of the worst years in LA’s history. While Los Angeles was literally burning to the ground in response to the Rodney King incident, O.J. continued to play golf and beat up his young white wife in Brentwood, one of the wealthier/whiter neighborhoods in Los Angeles. And that’s what makes O.J. : Made in America as fascinating as it is. The film is part character study of a deeply complex and troubling superstar, but is also an examination of race in America. And it all cultivates to the section of the film when O.J. is fighting for his life in the murder trial. LA had just gotten over the Rodney King riots, and the fact that Simpson’s lawyer’s argued that Simpson was wrongly being judged based on the color of his skin, and quickly became a hero to black people in Los Angeles because of this. A man who lived a very white and wealthy lifestyle was being persecuted because of the color of his skin. The film features interviews from dozens and dozens of people who knew O.J. and were at one point involved with his life or crossed him. Lawyers from the trial on both sides, old colleagues, friends, reporters, etc. They all help shed a light on what O.J. was like both in the limelight and behind the scenes. The portrait isn’t a pretty one by any means, and its a character study that is one of the most fascinating I’ve seen in years, both on television or on film. O.J. : Made in America has aired in its entirety and is available to stream on WatchESPN. It’s one of the best films of 2016, period. Fans of recent true crime doc series’ like Making a Murderer and The Jinx will feel right at home with this chilling and fascinating 7+ hour character study of a man who many knew as “The Juice”. I can guarantee you that there won’t be a whole lot of films you’ll see in the theater this year that are as fascinating, informative, and well made as O.J. : Made in America. Loved this and couldn’t stop watching it. I’m not a big fan of biopics because I usually find documentaries more compelling. This was no exception. Definitely the best ESPN has done so far.